The internet got shut off. Life got complicated. Enderender maintenance became less of a priority. Sine last posting, I traveled by thumb from Portland, Oregon to Los Angeles California. I came back to New Orleans afterwards and things were bad. Then I left America at the start of last year, went travelling in the Middle East. I returned to New Orleans, this time in late spring. Now I work in a public library. Ideas for sustainable urban futures specifically focused on arguments for density, localization, and city planning as a collective, participatory activity. The premise for this collection of essays centers around the comparison of various locales (New York, Las Vegas, Istanbul, Diyarbakir–to name a few) to the author’s own, Vancouver. The result is a civic-minded sampling of the successes and failures of different cities, with special attention paid to the possibilities of the places being analyzed. Common Ground has a lot to with basic considerations of public space. A lot of the themes throughout the book suggest that in order to transform our cities–whether it be through redesign, repurposing, or rehabilitation–we need to first change the way we think about them. Makes sense. Hern’s approach to the shaping of cities is informal, organic, and spirited. He’s into bikes, potlucks, and as much shared space as possible. 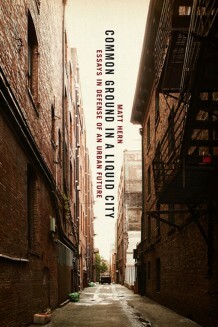 Corporate interest and privatization don’t make for the kind of city he’s trying to envision in this book. Essentially, he’s calling for cities to be built from the ground up, to develop character on their own, rather than be assigned one by aggressive development firms and government officials. The writing is consistently approachable, although he could probably stand to put a little more effort into the visuals accompanying his next book. It wouldn’t be unfair at times to categorize Hern as “idealistic”. Of course, imagining the type of place we want to live and be a part of is a lot easier than actually implementing the changes necessary to make that place a reality. His best argument is for densification, building fecund urban centers with lots of resources and preserving the rural areas in the process. I’d probably be pulling quotes from it if I didn’t already lend it out, recommending it to a friend as definitely worth reading. I developed a weird fascination with playscapes awhile back. This article is about the trials of New York City playground development, the radical urban playground designers of the 60’s, and Robert Moses. In my reading, I was dragged back to the age of six-years old, running around on what would now be most certainly condemned as a totally unsafe playground at The Hansen Elementary School in the suburbs of Massachusetts. It’s gone now, replaced by a generic, prepackaged play environment. It was made mostly out of thick lumber and old tires. There was a pyramid you could crawl on top of and around and inside, made completely out of conjoined automobile tires! And it was on the huge monster-truck tires, half-buried in the sand, with an 8-foot gap in between them traversable through a rope swing, where I split open my forehead. Lots of crying, some stress for my father, and a few stitches. I look back upon that place as magical, maybe even more so because of my painful experience. Reimageining Recreation does a good job of positioning these designers amongst fine artists and, especially, land artists. It’s seems totally reasonable to talk about playgrounds and the Spiral Jetty or Roden’s Crater in relation to one another, conceptually juxtaposing these spatial interventions. 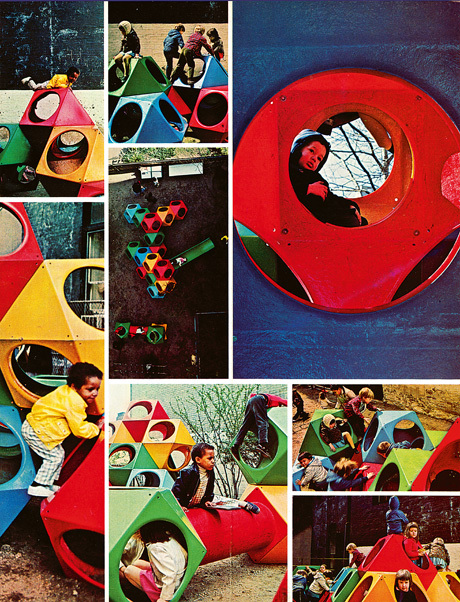 The playscapes were the first in New York to be designed by architects—idealistic, savvy, and ambitious young designers with their own tots in tow, steeped in New Left politics, versed in current social theories and child psychology, and at home in downtown art circles. (Friedberg was a lifelong friend of artist Jackie Ferrara, whose feminist take on post-minimalism featured wooden staircases, ramps, and stacked pyramids that almost invited the viewer to start climbing on them.) Unbeknownst to most, Dattner and Friedberg embodied a small but important vanguard working in parallel and often anticipating the environmentally engaged work of Robert Smithson, Nancy Holt, Robert Morris, Sol LeWitt, and others. In 1949, L. Wilson Greene, Edge wood’s scientific director, typed up a classified report, “Psychochemical Warfare: A New Concept of War,” that called for a search for compounds that would create the same debilitating mental side effects as nerve gas, but without the lethality. “Throughout recorded history, wars have been characterized by death, human misery, and the destruction of property; each major conflict being more catastrophic than the one preceding it,” Greene argued. 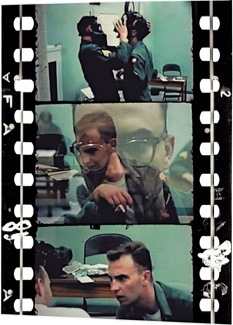 “I am convinced that it is possible, by means of the techniques of psychochemical warfare, to conquer an enemy without the wholesale killing of his people or the mass destruction of his property. 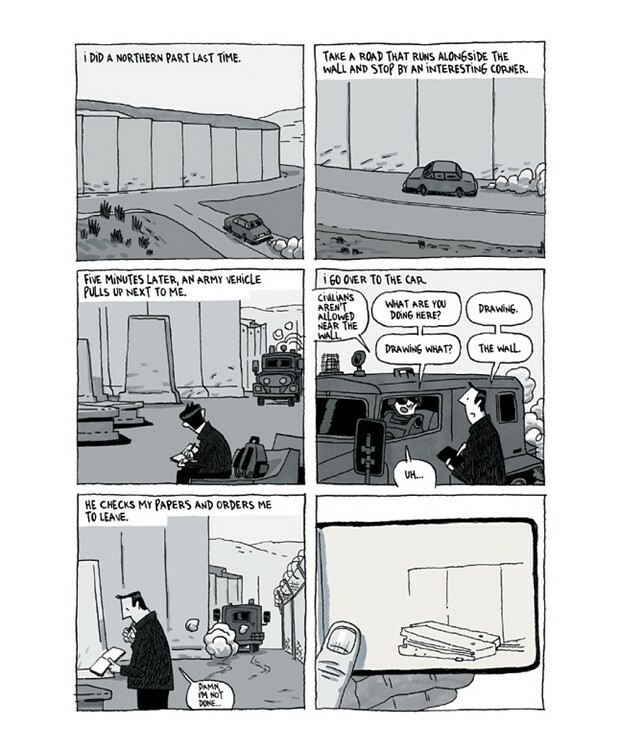 Guy Delisle documented, in comicbook form, his year spent in Jerusalem. His partner worked for Doctors Without Borders, spending much of her time in Gaza, while Delisle looked after his two young children and explored his surroundings. What came out of this is a very honest account of Delisle’s personal experiences in a place of conflict. I think the initial naiveté of the author is actually one of the strengths of the work. From the beginning, he seems routinely surprised at the conditions produced from the tensions between Israel and Palestine. He’s not visiting Israel for religious or historical reasons, nor is he visiting Palestine in the interest of solidarity or politics. Instead, it seems more like he just ended up there, the caretaker for the kids while his wife was at work. For this reason, Delisle’s perspective is valuable. Simple and straight-forward. It’s a good counterweight to reading Joe Sacco….but if you’re going to only read one, definitely choose Sacco. 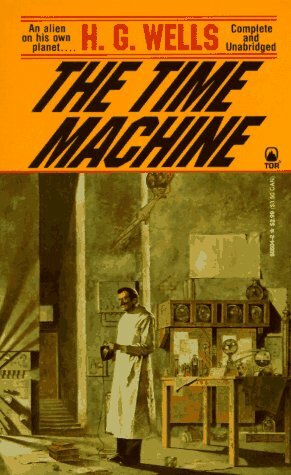 I’ll spare you from my own unabashed adoration of the father of modern science fiction and just leave you with a crude synopsis: A scientist travels way far into the future. The leisure class has turned into supple, dim-witted imps, the working class into subterranean savages. The future looks bleak. Both these articles came from the same place (Motherboard), around the same time (the Mayan Apocalypse), and deal with the same content (doomsday bunkers) so I grouped them together. Remember 2012? Like last year, when that thing didn’t happen? Well, at the very least, it propelled “the end of the world” into the mainstream for awhile, which was exciting and then, quickly, tired and annoying. When reading about these survival bunkers, I can’t help but think of that old Don Johnson movie A Boy and His Dog. I’m specifically thinking about the post-apocalyptic, subterranean community that kidnaps the young Don Johnson for his sperm. In this underground society created in the aftermath of nuclear disaster, it’s all hyper-Americana and inbreeding, weird violence and verbal instructions for apple pie blasting out of speakers. Not necessarily a future worth sticking around for. Sounds fun. And according to the Vivos website, this mass hysteria, necessitating a flee from collapse into the underground, could be a result of any number of forces including, but not limited to, bio war, anarchy, a killer comet, a global tsunami, or a super volcano, respectively. 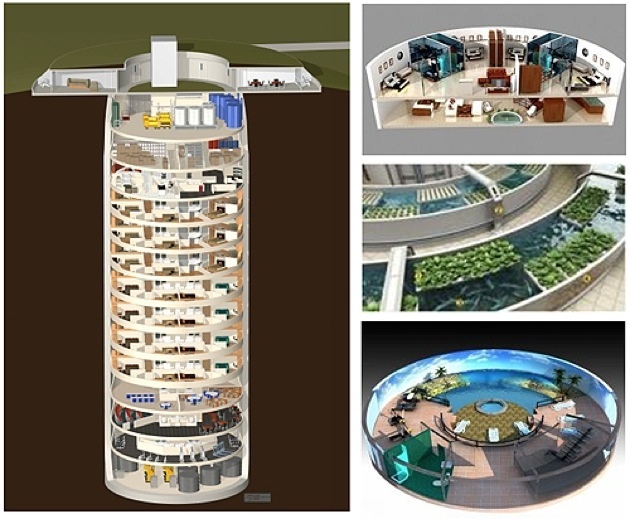 So with all the comforts that any wealthy survivalist could throw money at, Larry Hall has designed the survival condo for likeminded millionaires savvy enough to realize that if or when the economy or society goes to pot, their cash-at-hand will be worthless, and their survival investment will be money well spent. But surely Hall realizes this, too? It’s my hope that, come time to batten down the hatches, those people sharing his oxygen don’t get on his nerves when all the profit he’s made becomes worthless in a barter-based economy. More architecture for the apocalypse. 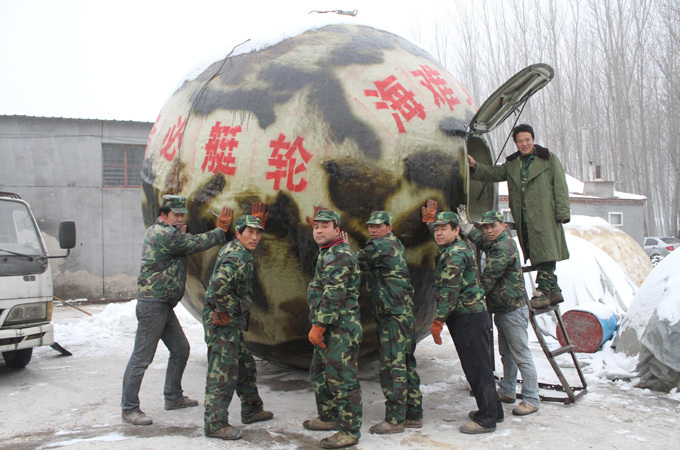 Imagine the end of the world actually happening, the only survivors being the guys brazen enough to lock themselves inside a giant ping-pong ball. 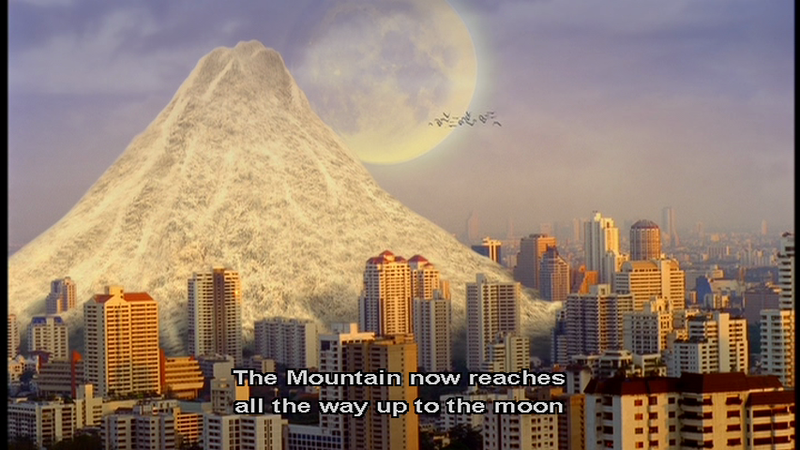 Or better yet, imagine the end of the world being brought on by a global tsunami, earth turned into one giant ocean dotted with tsunami survival pods carrying the last surviving members of mankind, trapped inside giant ping-pong balls. Found this really interesting interview [via Good] conducted by Believer with the New York City Department of Sanitation anthropologist-in-residence Robin Nagle. Her concept of “future trash” is as simple as it is austere, it’s anthropological extract, once adopted, amounting to an altered, all-encompassing perception of material culture. Among many of the questions raised by Nagle, one of the more striking inquires delved into an examination of consumer-culture and societies perpetuated by waste. While discussing sweltering piles of garbage and waste produced by an ecologically careless/capitalist/consumer culture, it’s worth mentioning the physical phenomena that is Fresh Kills. Located on Staten Island, Fresh kills is “one of the only man-made structures massive enough to be visible from earth’s orbit”. 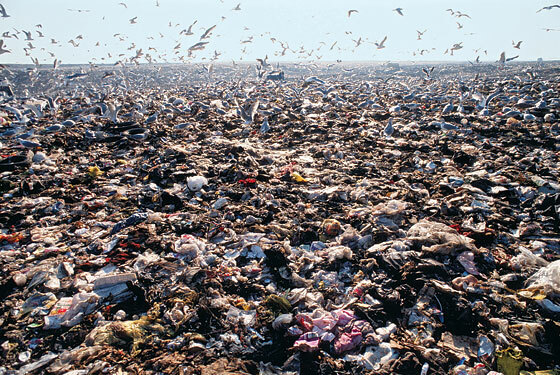 Presently closed-down and slated to eventually become phased into a public park, Fresh Kills used to be the largest landfill in the world, the Puente Hills Landfill of Los Angeles County now currently being the largest functioning landfill in the country. The Center for Land Use Interpretation did a tour out there that you can hear about here. The surreal notion of the volume of our material output makes me wonder if this stuff will eventually become part of the landscape in a more apparent way, ala the Thai film Citizen Dog, where a mountain of plastic bottles in the city of Bangkok becomes a recreational attraction in the urban environment, a majestic retreat for lovers interjected into the skyline. It seems unavoidable that all this “stuff” will eventually force itself into our lives in a way in which we can no longer hide it in rural landfills and other areas under-populated by humans, like the ocean, unless we make serious changes in our lifestyle choices and develop creative solutions to such problems. As we are already turning our landfills into parks, perhaps the future will lead us into creating a new topography defined less by natural environmental forces and more by the scraps and discards of the everyday. To read a really awesome New York Magazine article about the reclamation of Fresh Kills into “a new paradigm for a park”, click here. I highly recommend the further reading in relation to the ideas presented in this post.